Given the chronic ailments that come with age, it’s no surprise that older adults use more prescribed and over-the-counter medicine than any other age group. But that also makes seniors more susceptible to the dangers of medication mismanagement. 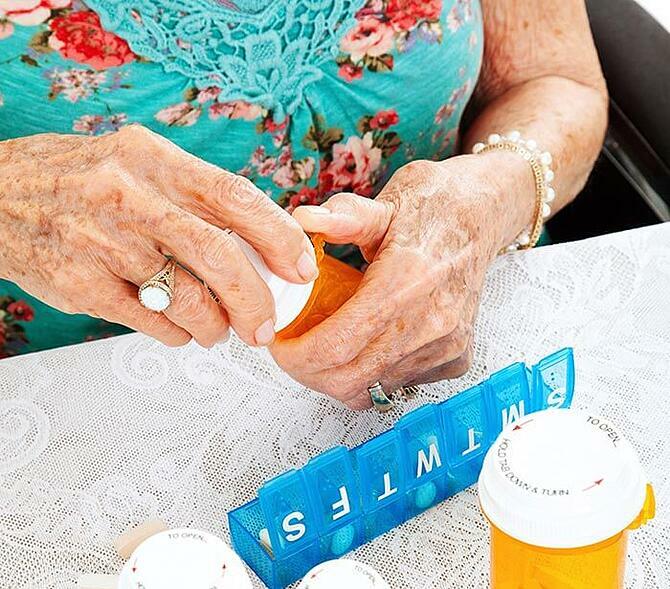 As a caregiver providing support to a spouse or parent, knowing the guidelines for administrating medications to seniors can help prevent you from mixing the wrong drugs. In 2012, the American Geriatrics Society released updated medication guidelines for health care providers that identify specific medications seniors should avoid entirely, prescriptions that should be used with caution and drugs that shouldn’t be taken when certain ailments are involved. For example, painkillers like acetaminophen and ibuprofen can have adverse effects when mixed with certain prescription drugs. The guidelines also recommend that seniors avoid sedatives like Ativan because it can cause confusion and a decline in mental health. To ensure your loved one’s combination of medications is safe, follow these caregiver medication management tips. Research the dosages, frequency and possible side effects of your loved one’s prescriptions. Ask why a drug has been prescribed, and ask the doctor for clear instructions on how your loved one should be taking the medication. Ask what time of day it should be taken, whether or not it should be taken with food and for any other information. Write these instructions down and place them with your loved one’s medication—make sure that if other caregivers are offering support, they know everything you know. Write down names, amounts and dosage frequencies for all medications your loved one takes. Include over-the-counter drugs and herbal supplements. Also make a list of doctors—including which doctor prescribed which medication—their specialties and contact information. This will help you keep track of everything your loved one takes on a certain day or week and how much of each he or she is taking to ensure safe medication intake. To avoid misusing or confusing medications, use original containers and don’t mix everything in one container. If you put together a pill case each week for a loved one, make sure he or she understands how to use it. It may seem obvious, but the average older adult takes five or more prescriptions each day. Each prescription is different, so always follow individual directions. Additionally, filling all of your loved one’s medications at one pharmacy can reduce the risk of drug interactions—and save you time when picking up medications. Don’t be shy about taking written questions to your loved one’s doctors or pharmacist, especially when a new drug is involved. Write down answers. It can be hard to remember details hours after a conversation. Talking Medication Bottles: A simple chip enables caregivers to record messages identifying the medication type, dosage and time(s) to take it. Automatic Medication Dispensers: These are programed to automatically dispense correct dosages at the correct time of the day. Medication Alarms Watches and Bracelets: Being a caregiver involves juggling a lot of tasks. These send alerts according to predetermined schedules to remind you to give your loved one medicine. Mobile Apps: Interactive applications, like Pillboxie or Medisafe, send reminders on when to take medicine and keep track of the pills that have been taken.